Enough is enough. If ever we needed confirmation that Jose's time is up, his after match comments at the King Power Stadium ram home that point unequivocally. If you doubt me - and the pro Mourinho party out there are still painfully hanging on to past glories (note the tense) - just replay the video of his interview. I paraphrase a key message from it: 'Last season, I got you to play at a higher level and because of that, we won the title. This season, the mess we are in is because you are not playing to instructions'. Put another way, when we win, I take the credit and when we lose, it's the player's fault. Oh really? Who picks the frigging team Jose? Who decides on the defensive and negative tactics? Who decides that one of our most creative midfield players should be in a defensive midfield role which he is clearly not suited to? Who persists with a striker for weeks on end who is a pale shadow of his former self? Who said that if there is 'one player I owe something to it's Remy' and then barely gives him playing time? Who decided to play a 'false 9' (and that term could be applied to your beloved Diego Costa, given his current form') against a team from the championship? Who opens his mouth and comes out with complete garbage in terms of after match comments? 'We are not getting what we deserve' - just look at the league table Jose. It doesn't lie. Who one week says that he does not deserve the crowd singing his name, and then next week distances himself from the failures and blames the players? You were actually right first time Jose, you don't deserve that kind of support. Who starts preaching about humility in the aftermath of last nights defeat, but couldn't bring himself to admit that he got it wrong with Eva Caneiro (she was doing her job, you numpty). There is obviously only one answer to all of these questions, but don't expect Jose to take responsibility - that takes humility and guts. And please, all you who remain convinced of Jose's quality and that he will turn it around, I no longer care. 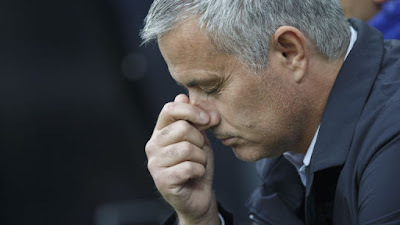 Even if we did win our next 2 games, Jose, you have lost my respect. I am thankful for what you brought to this club, but I am no longer convinced that you are the man for the long term. You have been a legend, but your legacy is being tainted. You have often said how much you love our club. If that were true, you would take your share of the responsibility for our current situation and having lost the dressing room - and I cannot believe, in my wildest thoughts, that your comments last night will do anything other than alienate the players - you would do the honourable thing and resign. Love isn't selfish Jose - it's selfless. It puts others first - in this context, the club - and self second. Nothing in your comments last night speak of selflessness. I can take losing - like many Chelsea fans of a certain age, I have seen us relegated, nearly go out of business, and go through all kinds of lows. The highs have been all the more enjoyable because of them. But we need somebody braver, stronger and more giving to lead our club into the next phase. Relegation is a real possibility - I alluded to this in my last article, referencing the squad of the late 80's that was deemed 'too good to go down'. We need a new personality to galvanise our season and save us from an unprecedented demise. Who? I honestly don't know. But if Jose doesn't go soon, the consequences don't bear thinking about.